Ohio State may be Pretenders, and Tennessee may not be the Lord of the Rings, but we know “Precious” when we see it, and we saw a lot of it at the Rose Bowl on Labor Day. The Bruin Cheerleaders were posing for photos about three hours before the game, and then they led the crowd in welcoming the Bruin players off the buses and into the Walk-In. They followed that with a performance backed by the Alumni Band, and then they headed in to lead the crowd to become the 12th Man, and help the Bruins to victory — The Vols incurred a couple of setbacks due to Rose Bowl noise. Before the game, the Vol Cheerleaders were on the sidelines, doing some little routines for the sizable Tennessee contingent. The “S-E-C” chants that were so prevalent before the game were noticeably absent AFTER the game, when the Vol fans had nothing left to cheer about. One other thing to cheer about is the free sandwich deal from Branders BBQ that we did last week. They took in a lot of coupons, and the free small sandwiches were delicious, and not too small at all. Expect a coupon good for the next home game to be coming soon. "PRECIOUS TIME" was published on September 7th, 2008 and is listed in UCLA/usc/Cheerleader Photos. The UCLA Dance Team…best in the PAC 10, best in the nation. Another excellent pictorial! They all look wonderful, Brianna = two thumbs up! Thanks. Thanks for solos of Katie, but one only is just not doing her any justice, but I’ll take whatever you got featuring the gorgeous Katie. Go Katie! Go Bruins! Yikes! I’m not entirely sure that all of those Vol cheerleaders are women. The last three pics ( the last 2 are of the same person) look like…well…there’s just no nice way of saying this – they look like dudes! Makes me believe that the state of Tennessee may have a new equal opportunity/non-discriminatory clause when it comes to cheerleading. Either that or the other SEC schools took all the cute ones. LMAO, you’re so friggin’ right!! LOL those some of the UGLIEST cheerleaders EVER! I think I’m gonna have nightmares tonight. Thank you God for our spirti squads, I appreciate them more than ever. 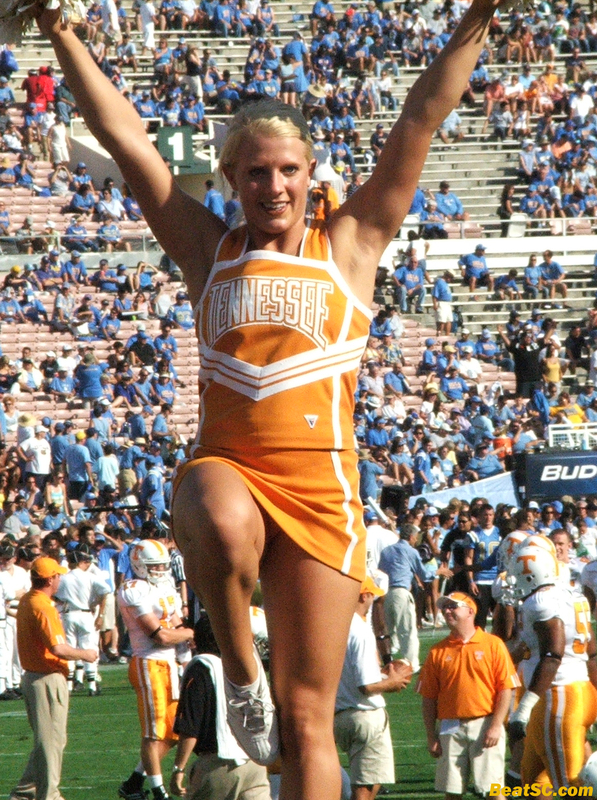 May God never punish UCLA and give us the UT cheerleaders.